By now, most Americans are well aware of the air pollution created by power plants or heavy vehicle traffic. These sources discharge harmful particulate matter that becomes suspended in the air, creating what's called an aerosol. However, another source of air pollution may be hiding right beneath our noses—restaurants. 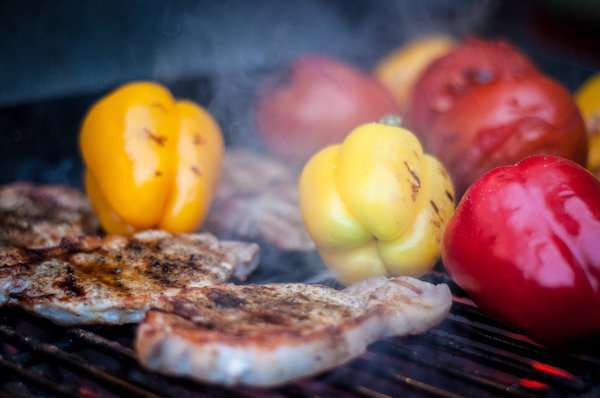 "Restaurant food-cooking emissions are a major, if not the major, driver of spatial variability of organic aerosol," says Carnegie Mellon University's Ellis Robinson. Translation: Restaurants are mainly responsible for high concentrations of organic aerosol (OA), a large source of air pollution, within their immediate surrounding areas. Robinson, a postdoctoral researcher at Carnegie Mellon's Center for Atmospheric Particle Studies (CAPS), was the leader of the recent study that produced this finding. Restaurants cook with large amounts of oils and other organic matter, which is aerosolized into OA and ventilated directly from the kitchen in the form of exhaust. This exhaust carries the OA produced in the cooking process out into the urban environment. While cooking has already been documented as a major source of OA, Robinson and the team from CAPS decided to take the innovative step of taking their study to the streets by making their measurements within neighborhoods containing many restaurants and busy thoroughfares. Using an instrument called an aerosol mass spectrometer to measure air quality throughout the city of Pittsburgh, Pa., the team was able to trace OA concentrations back to their origin. The device allowed them to accurately determine whether the OA had originated from restaurant sources or traffic sources, the other major contributor to OA in urban areas. They conducted most of their measurements during the early evening, when the overlap of rush-hour traffic and dinnertime ensured that both sources were at their max OA output. The results were profound. Of the high-concentration OA "plumes" the team measured, seven out of every ten originated from restaurants or other cooking sources. While these findings may raise some eyebrows, they're easier to believe when considered within a larger context. Unlike automotive emissions, which have come under increasing scrutiny as a source of air pollution, restaurants and commercial kitchens have largely been ignored. Other than New York City and a handful of cities in California, few local governments have placed restrictions on how these establishments vent their exhaust. Still, with continued additions to the literature like Robinson's study, awareness of the effect of restaurants on air quality is growing. As he notes, restaurant locations are often distributed very differently than other sources of pollutants. While Robinson believes that the study has shed light on an underemphasized source of pollution, he also wants to make it clear that this issue is a manageable one—with some major cities already tackling the problem with mandatory exhaust filtration, more are sure to follow suit. "I don't want someone to see this and think that we need to close all restaurants," he says, "but I think it's good if we've compelled people to think a little more about food cooking as part of the larger air quality picture." This work was performed by members of the Center for Atmospheric Particle Studies (CAPS) and the Center for Air, Climate and Energy Solutions (CACES). The findings were published in Environmental Science & Technology.